At One Small Garden, we believe everyone has within them the power to grow a garden. With this belief in mind, we’ve created unique raised beds that make the timeless tradition of growing food a simple, purposeful pleasure. Once your raised garden is in place, with a little tending, you can harvest delicious, healthy food from it for years to come. Just add your favorite seeds, sunlight and regular watering - exactly the way our mother’s mothers grew food for their families - and you’ll be on your way. 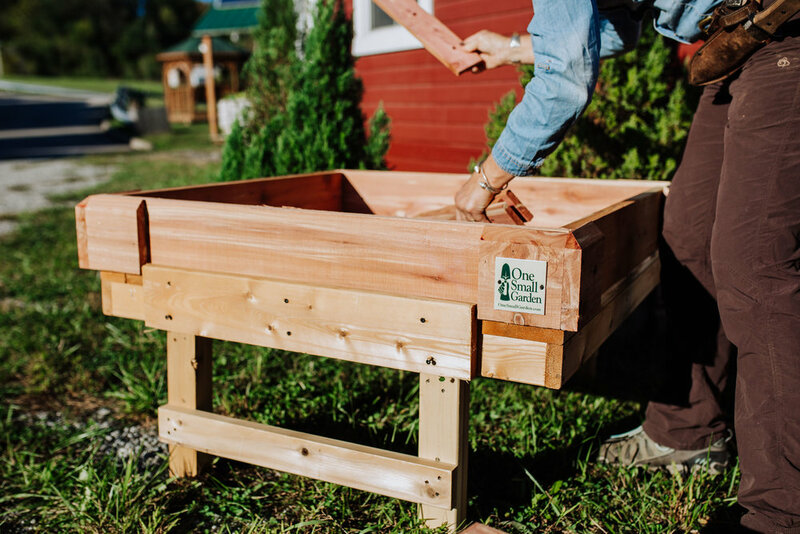 Each raised garden is made with local, enduring food-safe red cedar using Amish-style craftsmanship and 2” mill standard boards. Lasting up to 20 years, they can be arranged to create a variety of shapes and sizes to suit your needs. Anywhere the sun shines for about 6 hours a day can become the perfect place for your garden! In the interest of simplicity, we’ve designed our gardens to be incredibly easy to install. The unique "tool free assembly" of our raised gardens also translates to an uncomplicated disassembly, allowing your garden to move when you move. Many of our customers enjoy the "modular design" of the gardens which allows the gardens themselves to expand easily for greater soil depth or be raised higher for a good Cold Frame Curtain height. All of our pieces are interchangeable making designing your garden not only easy, but also unique to your space. No matter where you are in your gardening journey, One Small Garden can help! If you’re a beginning gardener, our One Small Gardens are as close as it gets to foolproof. We’ll show you everything you need to know from your first planting through that season’s harvest. If you’re an experienced gardener, our raised garden beds will give you a higher yield per square foot than anything you’ve ever experienced before. We have found that our raised beds are more successful and have higher average yield than traditional tilled-earth gardens for many reasons. Because our system allows for flexibility in the design of your garden, they can be built to fit your lifestyle. Due to the flexibility of gardens, we can bring your garden closer to your day to day routine. You can enjoy your garden on your patio, in your yard and in most hard scape or urban environments! Our product was designed to extend your growing season, even into cold winter months. With our optional Cold Frame Curtain, we can provide season extension to gardens to ensure the longest possible growing seasons--nearly year round growth. Also, raised garden beds are easier to protect from most critters by virtue of size and location. While be believe in sharing your bounty, we also want to help you preserve your growth! A Tabeltop Garden provides ease of access. Raised beds are also more approachable for children to work around, as well as being easier on the knees and backs of adults. Our product was designed with the belief that gardens should be within everyone's reach. One Small Gardens are now available in table-based heights. Literally raising the ease of access, these beds are perfect for hard surface locations and the handicapped. One Small Gardens are easy to move if you decide that you want your garden in another location. Because of our tool-free assembly system, our gardens are easy to assemble and just as easy to take down!